A variety of options are available from Parker to suit the specific needs of your application and environment: the MSHA-accepted ToughCover, the superior polymeric SuperTough, and the unparalleled abrasion resistance of Parker's polyurethane ToughJacket series. Parker's ToughCover is constructed from synthetic rubber and is 80 times more abrasion resistant when compared to their Standard rubber cover. 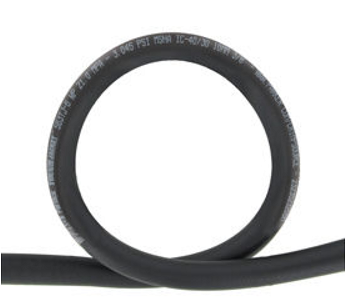 The polymeric SuperTough cover offers superior protection from abrasive environments, with 450 times more abrasion resistance than Parker's standard rubber hose. 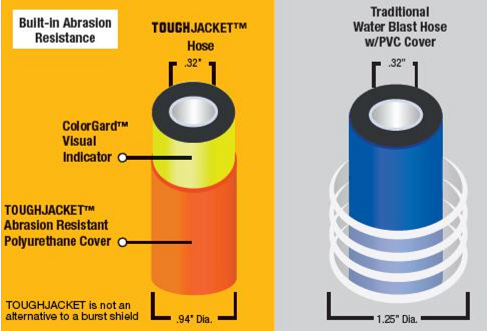 Parker's ToughJacket™ series of abrasion resistant hose covers is 650 times more durable and abrasion resistant when compared to standard rubber hose. The lightweight, compact ToughJacket™ offers superior UV resistance, excellent flexibility and a very low coefficient of friction. Introducing Parker's newest addition to the ToughJacket series: Ultra High Pressure ToughJacket™ hose. This robust water-blasting hose has built in abrasion resistance that eliminates the need for a PVC hose sleeve, reducing the overall hose assembly weight by 16 percent and the O.D. by 25 percent. The Ultra High Pressure ToughJacket™ hose also features ColorGard™ technology that provides an early warning system for hose abrasion issues.